Today I will show you Detailed steps to Root Galaxy S6. Samsung galaxy S6 is a new fantastic flagship device from the world’s biggest phone manufacturer. Samsung has pleased its many users by the new design of galaxy S6. Samsung has changed the trend of of plastic body by all new metal finished look of galaxy S6. Samsung galaxy S6 is made of a solid metal frame with corning gorilla glass 4 on both sides giving it a completely new look and feel. The device has the same 5.1 inch screen and button placements. The device has a Quad HD display which makes its screen brighter and more crisper with fabulous graphics. But with the change in design samsung has droped the SD Card Slot and removable battery. The samsung galaxy S6 is backed up with powerful Exynos Octa Core processor, 3 GB of Ram and 32/64/128 GB of storage. The galaxy comes in fantastic four different colors, white, black, gold, and blue. Samsung has really done a great job with galaxy S6. Also see Galaxy S6 Edge root guide. Rooting the Galaxy S6 voids the warranty so it is completely at your own risk. Also this method is for the above listed Galaxy S6 models only i.e, SM G920F, SM G920I and SM G920T. Don’t try this on any other model. IF something goes wrong with your phone then Droidopinions.com won’t be reponsible. This tutorial is meant for educational purpose only. The latest samsung galaxy S6 is ready to root. Thanks to the well known rooting experts Chainfire that has revealed CF-AUTO Root for galaxy S6. By rooting the device we can get the full access over the phone. We can install many apps that require root access. Also we can overclock the CPU to optimum power. All the software restrictions are removed by rooting the phone. Thus the user gets full access over his device. 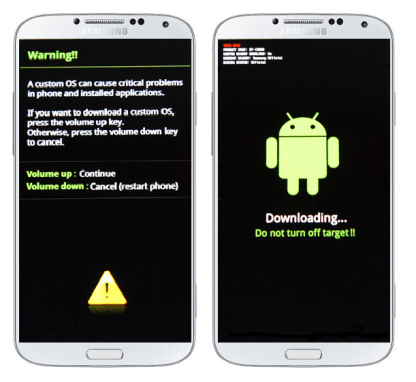 First of all you need to download the CF-Auto Root package which is compatible with your device. So, check the model of your galaxy S6 and download from following links. Now download the samsung usb drivers from [here] and install if you don’t have them on your PC. Download odin 3.09 on your pc. Now extract and run Odin 3.10.exe. Now on your device go to settings–>Developer Options and enable USB debugging mode. If you don’t find any developer options in settings then go to About Phone in settings and tap on “Build number” repeatedly. This will enable Developer options on you phone. Switch off your phone then press and hold “power+ Home+ Volume down” buttons and a warning screen will be shown then press “Volume Up” button to get into download mode. Now connect your galaxy S6 to the PC via USB data cable. The odin will detect the device and the colored ID.COM box will appear like in the image below. Unzip the CF-Auto root file that you have downloaded and then open the odin and click on PDA or AP file and choose the unziped CF-Auto root file which is in tar.md5 format. Now after choosing the file you can click on the start button and wait for sometime to complete the flash. Also make sure that Auto Reboot and F. reset box is checked. When the flash is complete the pass message will appear like in the image below. Unplug the device and wait for it to reboot. After the reboot you can see the super su app in the apps menu. Now your samsung galaxy S6 is rooted and ready to use. NOTE: IF ODIN IS STUCK DURING THE FLASH THEN UNPLUG THE CABLE AND REPEAT THE PROCESS AGAIN. This it. Hope you like it. Share it and subscribe. Comment below if you have any problem.